The Nobel Prize in Chemistry (Swedish: Nobelpriset i kemi) is awarded annually by the Royal Swedish Academy of Sciences to scientists in the various fields of chemistry. 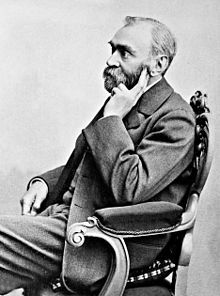 It is one of the five Nobel Prizes established by the 1895 will of Alfred Nobel, who died in 1896. These prizes are awarded for outstanding contributions in chemistry, physics, literature, peace, and physiology or medicine. As dictated by Nobel's will, the award is administered by the Nobel Foundation and awarded by the Royal Swedish Academy of Sciences. The first Nobel Prize in Chemistry was awarded in 1901 to Jacobus Henricus van 't Hoff, of the Netherlands. Each recipient receives a medal, a diploma and a monetary award prize that has varied throughout the years. In 1901, van 't Hoff received 150,782 SEK, which is equal to 7,731,004 SEK in December 2007. The award is presented in Stockholm at an annual ceremony on 10 December, the anniversary of Nobel's death. At least 25 laureates have received the Nobel Prize for contributions in the field of organic chemistry, more than any other field of chemistry. Two Nobel Prize laureates in Chemistry, Germans Richard Kuhn (1938) and Adolf Butenandt (1939), were not allowed by their government to accept the prize. They would later receive a medal and diploma, but not the money. Frederick Sanger is one out of two laureates to be awarded the Nobel prize twice in the same subject, in 1958 and 1980. John Bardeen is the other and was awarded the Nobel Prize in physics in 1956 and 1972. Two others have won Nobel Prizes twice, one in chemistry and one in another subject: Maria Skłodowska-Curie (physics in 1903, chemistry in 1911) and Linus Pauling (chemistry in 1954, peace in 1962). As of 2018, the prize has been awarded to 180 individuals, including five women: Maria Skłodowska-Curie, Irène Joliot-Curie (1935), Dorothy Hodgkin (1964), Ada Yonath (2009), and Frances Arnold (2018). There have been eight years in which the Nobel Prize in Chemistry was not awarded. There were also nine years for which the Nobel Prize in Chemistry was delayed for one year. The Prize was not awarded in 1914, as the Nobel Committee for Chemistry decided that none of that year's nominations met the necessary criteria, but was awarded to Theodore William Richards in 1915 and counted as the 1914 prize. This precedent was followed for the 1918 prize awarded to Fritz Haber in 1919,, the 1920 prize awarded to Walther Nernst in 1921, the 1921 prize awarded to Frederick Soddy in 1922,, the 1925 prize awarded to Richard Zsigmondy in 1926, the 1927 prize awarded to Heinrich Otto Wieland in 1928, the 1938 prize awarded to Richard Kuhn in 1939, the 1943 prize awarded to George de Hevesy in 1944, and the 1944 prize awarded to Otto Hahn in 1945. ^ "Alfred Nobel – The Man Behind the Nobel Prize". Nobelprize.org. Retrieved 7 October 2008. ^ "The Nobel Prize Awarders". Nobelprize.org. Archived from the original on 15 October 2008. Retrieved 7 October 2008. ^ "The Nobel Prize". Nobelprize.org. Retrieved 7 October 2008. ^ "The Nobel Prize Award Ceremonies". Nobelprize.org. Archived from the original on 22 August 2008. Retrieved 7 October 2008. ^ Malmström, Bo G.; Bertil Andersson (3 December 2001). "The Nobel Prize in Chemistry: The Development of Modern Chemistry". Nobelprize.org. Retrieved 8 October 2008. ^ "Nobel Laureates Facts". Nobelprize.org. Archived from the original on 2 February 2007. Retrieved 7 October 2008. ^ "Women Nobel Laureates". Nobelprize.org. Retrieved 7 October 2008. ^ a b "The Nobel Prize in Chemistry 1914". Nobelprize.org. Retrieved 6 October 2008. ^ a b "The Nobel Prize in Chemistry 1918". Nobelprize.org. Retrieved 6 October 2008. ^ a b "The Nobel Prize in Chemistry 1920". Nobelprize.org. Retrieved 6 October 2008. ^ a b "The Nobel Prize in Chemistry 1921". Nobelprize.org. Retrieved 6 October 2008. ^ a b "The Nobel Prize in Chemistry 1925". Nobelprize.org. Retrieved 6 October 2008. ^ a b "The Nobel Prize in Chemistry 1927". Nobelprize.org. Retrieved 6 October 2008. ^ a b "The Nobel Prize in Chemistry 1938". Nobelprize.org. Retrieved 6 October 2008. ^ a b "The Nobel Prize in Chemistry 1943". Nobelprize.org. Retrieved 6 October 2008. ^ a b "The Nobel Prize in Chemistry 1944". Nobelprize.org. Retrieved 6 October 2008. ^ "The Nobel Prize in Chemistry 1901". Nobelprize.org. Retrieved 6 October 2008. ^ "The Nobel Prize in Chemistry 1902". Nobelprize.org. Retrieved 6 October 2008. ^ "The Nobel Prize in Chemistry 1903". Nobelprize.org. Retrieved 6 October 2008. ^ "The Nobel Prize in Chemistry 1904". Nobelprize.org. Retrieved 6 October 2008. ^ "The Nobel Prize in Chemistry 1905". Nobelprize.org. Retrieved 6 October 2008. ^ "The Nobel Prize in Chemistry 1906". Nobelprize.org. Retrieved 6 October 2008. ^ "The Nobel Prize in Chemistry 1907". Nobelprize.org. Retrieved 6 October 2008. ^ "The Nobel Prize in Chemistry 1908". Nobelprize.org. Retrieved 6 October 2008. ^ "The Nobel Prize in Chemistry 1909". Nobelprize.org. Retrieved 6 October 2008. ^ "The Nobel Prize in Chemistry 1910". Nobelprize.org. Retrieved 6 October 2008. ^ "The Nobel Prize in Chemistry 1911". Nobelprize.org. Retrieved 6 October 2008. ^ a b "The Nobel Prize in Chemistry 1912". Nobelprize.org. Retrieved 6 October 2008. ^ "The Nobel Prize in Chemistry 1913". Nobelprize.org. Retrieved 6 October 2008. ^ "The Nobel Prize in Chemistry 1915". Nobelprize.org. Retrieved 6 October 2008. ^ "The Nobel Prize in Chemistry 1922". Nobelprize.org. Retrieved 6 October 2008. ^ "The Nobel Prize in Chemistry 1923". Nobelprize.org. Retrieved 6 October 2008. ^ "The Nobel Prize in Chemistry 1926". Nobelprize.org. Retrieved 6 October 2008. ^ "The Nobel Prize in Chemistry 1928". Nobelprize.org. Retrieved 6 October 2008. ^ "The Nobel Prize in Chemistry 1929". Nobelprize.org. Retrieved 6 October 2008. ^ "The Nobel Prize in Chemistry 1930". Nobelprize.org. Retrieved 6 October 2008. ^ "The Nobel Prize in Chemistry 1931". Nobelprize.org. Retrieved 6 October 2008. ^ "The Nobel Prize in Chemistry 1932". Nobelprize.org. Retrieved 6 October 2008. ^ "The Nobel Prize in Chemistry 1934". Nobelprize.org. Retrieved 6 October 2008. ^ "The Nobel Prize in Chemistry 1935". Nobelprize.org. Retrieved 6 October 2008. ^ "The Nobel Prize in Chemistry 1936". Nobelprize.org. Retrieved 6 October 2008. ^ "The Nobel Prize in Chemistry 1937". Nobelprize.org. Retrieved 6 October 2008. ^ a b "The Nobel Prize in Chemistry 1939". Nobelprize.org. Retrieved 6 October 2008. ^ "The Nobel Prize in Chemistry 1945". Nobelprize.org. Retrieved 6 October 2008. ^ a b "The Nobel Prize in Chemistry 1946". Nobelprize.org. Retrieved 6 October 2008. ^ "The Nobel Prize in Chemistry 1947". Nobelprize.org. Retrieved 6 October 2008. ^ "The Nobel Prize in Chemistry 1948". Nobelprize.org. Retrieved 6 October 2008. ^ "The Nobel Prize in Chemistry 1949". Nobelprize.org. Retrieved 6 October 2008. ^ "The Nobel Prize in Chemistry 1950". Nobelprize.org. Retrieved 6 October 2008. ^ "The Nobel Prize in Chemistry 1951". Nobelprize.org. Retrieved 6 October 2008. ^ "The Nobel Prize in Chemistry 1952". Nobelprize.org. Retrieved 6 October 2008. ^ "The Nobel Prize in Chemistry 1953". Nobelprize.org. Retrieved 6 October 2008. ^ "The Nobel Prize in Chemistry 1954". Nobelprize.org. Retrieved 6 October 2008. ^ "The Nobel Prize in Chemistry 1955". Nobelprize.org. Retrieved 6 October 2008. ^ "The Nobel Prize in Chemistry 1956". Nobelprize.org. Retrieved 6 October 2008. ^ "The Nobel Prize in Chemistry 1957". Nobelprize.org. Retrieved 6 October 2008. ^ "The Nobel Prize in Chemistry 1958". Nobelprize.org. Retrieved 6 October 2008. ^ "The Nobel Prize in Chemistry 1959". Nobelprize.org. Retrieved 6 October 2008. ^ "The Nobel Prize in Chemistry 1960". Nobelprize.org. Retrieved 6 October 2008. ^ "The Nobel Prize in Chemistry 1961". Nobelprize.org. Retrieved 6 October 2008. ^ "The Nobel Prize in Chemistry 1962". Nobelprize.org. Retrieved 6 October 2008. ^ "The Nobel Prize in Chemistry 1963". Nobelprize.org. Retrieved 6 October 2008. ^ "The Nobel Prize in Chemistry 1964". Nobelprize.org. Retrieved 6 October 2008. ^ "The Nobel Prize in Chemistry 1965". Nobelprize.org. Retrieved 6 October 2008. ^ "The Nobel Prize in Chemistry 1966". Nobelprize.org. Retrieved 6 October 2008. ^ "The Nobel Prize in Chemistry 1967". Nobelprize.org. Retrieved 6 October 2008. ^ "The Nobel Prize in Chemistry 1968". Nobelprize.org. Retrieved 6 October 2008. ^ "The Nobel Prize in Chemistry 1969". Nobelprize.org. Retrieved 6 October 2008. ^ "The Nobel Prize in Chemistry 1970". Nobelprize.org. Retrieved 6 October 2008. ^ "The Nobel Prize in Chemistry 1971". Nobelprize.org. Retrieved 6 October 2008. ^ a b "The Nobel Prize in Chemistry 1972". Nobelprize.org. Retrieved 6 October 2008. ^ "The Nobel Prize in Chemistry 1973". Nobelprize.org. Retrieved 6 October 2008. ^ "The Nobel Prize in Chemistry 1974". Nobelprize.org. Retrieved 6 October 2008. ^ a b "The Nobel Prize in Chemistry 1975". Nobelprize.org. Retrieved 6 October 2008. ^ "The Nobel Prize in Chemistry 1976". Nobelprize.org. Retrieved 6 October 2008. ^ "The Nobel Prize in Chemistry 1977". Nobelprize.org. Retrieved 6 October 2008. ^ "The Nobel Prize in Chemistry 1978". Nobelprize.org. Retrieved 6 October 2008. ^ "The Nobel Prize in Chemistry 1979". Nobelprize.org. Retrieved 6 October 2008. ^ a b "The Nobel Prize in Chemistry 1980". Nobelprize.org. Retrieved 6 October 2008. ^ "The Nobel Prize in Chemistry 1981". Nobelprize.org. Retrieved 6 October 2008. ^ "The Nobel Prize in Chemistry 1982". Nobelprize.org. Retrieved 6 October 2008. ^ "The Nobel Prize in Chemistry 1983". Nobelprize.org. Retrieved 6 October 2008. ^ "The Nobel Prize in Chemistry 1984". Nobelprize.org. Retrieved 6 October 2008. ^ "The Nobel Prize in Chemistry 1985". Nobelprize.org. Retrieved 6 October 2008. ^ "The Nobel Prize in Chemistry 1986". Nobelprize.org. Retrieved 6 October 2008. ^ "The Nobel Prize in Chemistry 1987". Nobelprize.org. Retrieved 6 October 2008. ^ "The Nobel Prize in Chemistry 1988". Nobelprize.org. Retrieved 6 October 2008. ^ "The Nobel Prize in Chemistry 1989". Nobelprize.org. Retrieved 6 October 2008. ^ "The Nobel Prize in Chemistry 1990". Nobelprize.org. Retrieved 6 October 2008. ^ "The Nobel Prize in Chemistry 1991". Nobelprize.org. Retrieved 6 October 2008. ^ "The Nobel Prize in Chemistry 1992". Nobelprize.org. Retrieved 6 October 2008. ^ a b "The Nobel Prize in Chemistry 1993". Nobelprize.org. Retrieved 6 October 2008. ^ "The Nobel Prize in Chemistry 1994". Nobelprize.org. Retrieved 6 October 2008. ^ "The Nobel Prize in Chemistry 1995". Nobelprize.org. Retrieved 6 October 2008. ^ "The Nobel Prize in Chemistry 1996". Nobelprize.org. Retrieved 6 October 2008. ^ a b "The Nobel Prize in Chemistry 1997". Nobelprize.org. Retrieved 6 October 2008. ^ a b "The Nobel Prize in Chemistry 1998". Nobelprize.org. Retrieved 6 October 2008. ^ "The Nobel Prize in Chemistry 1999". Nobelprize.org. Retrieved 6 October 2008. ^ "The Nobel Prize in Chemistry 2000". Nobelprize.org. Retrieved 6 October 2008. ^ a b "The Nobel Prize in Chemistry 2001". Nobelprize.org. Retrieved 6 October 2008. ^ a b "The Nobel Prize in Chemistry 2002". Nobelprize.org. Retrieved 6 October 2008. ^ a b "The Nobel Prize in Chemistry 2003". Nobelprize.org. Retrieved 6 October 2008. ^ "The Nobel Prize in Chemistry 2004". Nobelprize.org. Retrieved 6 October 2008. ^ "The Nobel Prize in Chemistry 2005". Nobelprize.org. Retrieved 6 October 2008. ^ "The Nobel Prize in Chemistry 2006". Nobelprize.org. Retrieved 6 October 2008. ^ "The Nobel Prize in Chemistry 2007". Nobelprize.org. Retrieved 6 October 2008. ^ As of 26 October 2008, the nobelprize.org website page for the 2008 award gives Shimomura's country as "USA". However, the press release from the Nobel Foundation on 8 October 2008, announcing the award, states that Shimomura is a Japanese citizen. "The Nobel Prize in Chemistry 2008–Press Release". Nobelprize.org. 8 October 2008. Retrieved 8 October 2008. ^ "The Nobel Prize in Chemistry 2008". Nobelprize.org. Retrieved 8 October 2008. ^ "The Nobel Prize in Chemistry 2009". Nobelprize.org. Retrieved 7 October 2009. ^ "The Nobel Prize in Chemistry 2010". Nobelprize.org. Retrieved 6 October 2009. ^ "The Nobel Prize in Chemistry 2011". Nobelprize.org. Retrieved 5 October 2011. ^ "The Nobel Prize in Chemistry 2012". Nobelprize.org. Retrieved 13 October 2012. ^ "The Nobel Prize in Chemistry 2013". Nobelprize.org. Retrieved 9 October 2013. ^ "Erviu Exclusiv Digi24. Stefan Hell, laureat al premiului Nobel: Educaţia primită în România m-a ajutat mult. Mi-a ușurat viața" (in Romanian). ^ "The Nobel Prize in Chemistry 2016". Nobelprize.org. Retrieved 5 October 2016. ^ "The Nobel Prize in Chemistry 2017". Nobelprize.org. Retrieved 4 October 2017. ^ Frank, Joachim (2017), Curriculum Vitae. Retrieved 4 October 2017. "Nobel Prize winners by category (chemistry)". Encyclopædia Britannica. Retrieved 6 October 2008. Wikimedia Commons has media related to Nobel laureates in Chemistry.